Sparrow Death - the notWildlife Blog - A collection of high quality backyard wildlife photos. We are sad to report another unexplained backyard death. This one is a sparrow who appears to have accidentally hanged itself in the bird feeder. 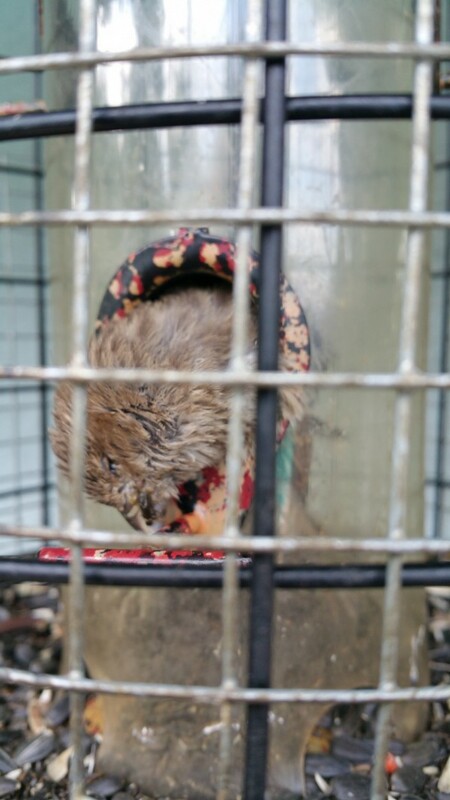 It is suspected that he somehow entered the inner portion of the feeder and was trapped at his neck as he tried to escape. He likely survived several minutes/hours standing on the bird seed to keep pressure off of his neck. What is not known is if the other birds realized that they would kill him as they ate the seeds that supported his weight. Another mystery is how he got his body there in the first place as the ports are too small. While this is the third backyard bird death, this is the first that cannot be directly linked to the Koi fish, although, no suspect has been completely ruled out at this point in the investigation. The feeder will remain closed and off limits until a full investigation is completed and at such a time that the feeder can be determined to be safe for use.